HKSAR Film No Top 10 Box Office: [2018.08.03] CHOW YUN FAT SWEET TALKS AARON KWOK INTO NEW FILM? 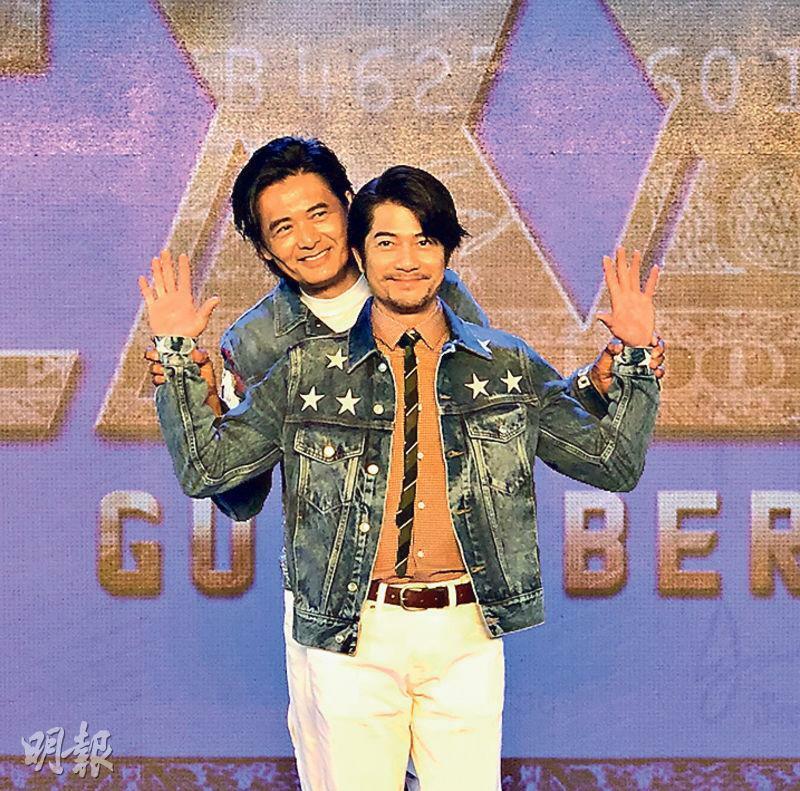 [2018.08.03] CHOW YUN FAT SWEET TALKS AARON KWOK INTO NEW FILM? 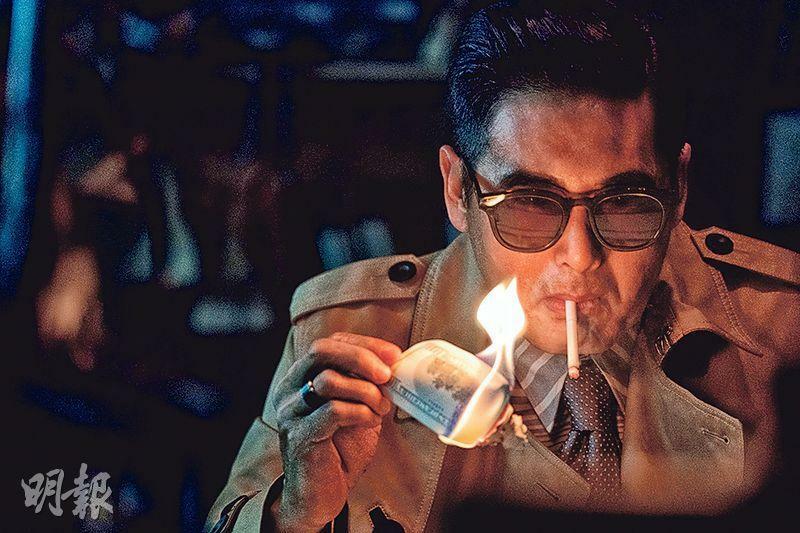 The Felix Chong Man Keung directed, Huang Bin produced, Chow Yun Fat, Aaron Kwok Fu Sing, Zhang Jingchu starred super production of the year PROJECT GUTENBERG (MO SEUNG) will open in Hong Kong in early October. The film yesterday held a Beijing press conference. Speaking of his reason of joining PROJECT GUTENBREG, Sing Sing admitted that he wanted to try a chance to make money. Mainly Fat Gor sweet talked him into it though. Fat Gor joked that he knew Sing Sing had a daughter and parenthood was very expensive. "I know money is tight for him, I want to help him out so he can live a little better." Director Chong Man Keung said that this time was his first crime action film. 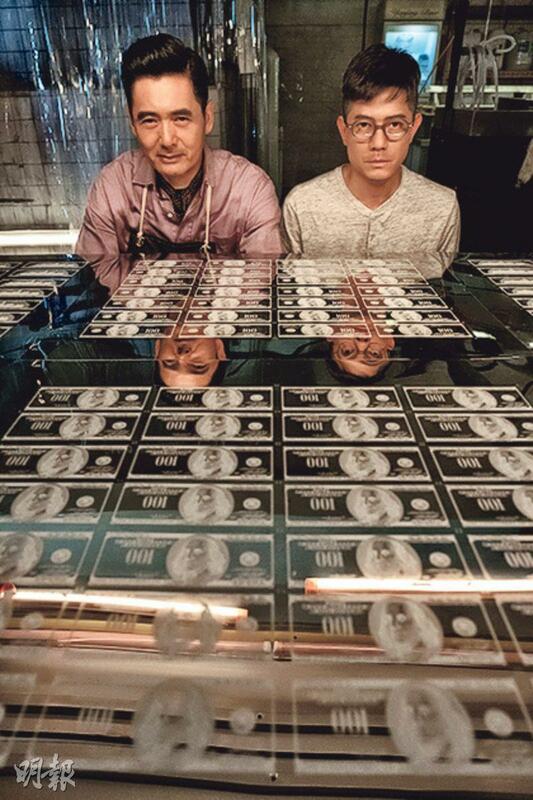 The currency counterfeit production process was also rarely seen in Chinese film. At the event the technical processes of the "peerless paper currency" production were on display. Chow Yun Fat and Kwok Fu Sing were full of chemistry. 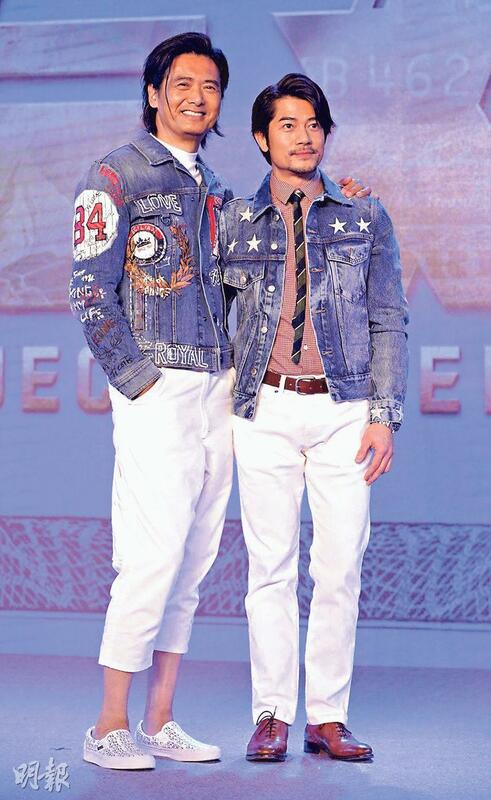 As both wore demin jackets and white pants. After months together they could almost read each other's mind. Sing Sing joked, "We swear we really haven't talked about this in advance!" Fat Gor as the "chief operating officer" talked about the operation, one of which was finding talent and controlling them in the palm of his hand. In the film he used Sing Sing as a "shield" and created counterfeit currency for him. In the film they were collaborators who relied on each other heavily but also had to defend against each other. Already a god class actor, Fat Gor said that this performance tested even him because he had to personally perform his stuns. Luckily he has been staying in shape and with his past action crime films like A BETTER TOMORROW, he was able to pass this test. The top technician Sing Sing complained that Fat Gor lured him into this entire process, but he was no idiot. In the process he and Fat Gor argued and broke up. Yet when they saw the "peerless currency" greed put them on the return of no return to crime. Fat Gor even stated after watching the film he finally realized the might of money's lure. Chong Man Keung chose Fat Gor and Sing Sing to be PROJECT GUTENBREG leads absolutely not by chance. 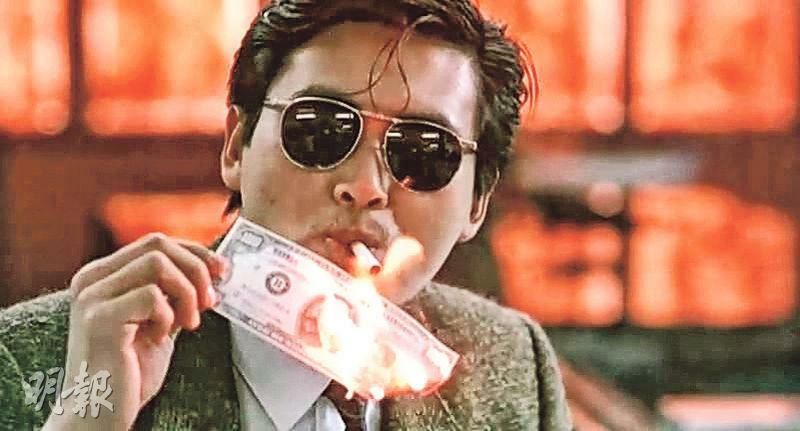 The director said that when he saw Fat Gor in A BETTER TOMORROW he already felt that he would have a huge connection to currency counterfeit organization. Sing Sing's keen power of observation and adaptability in COLD WAR left him a deep impression. Thus Chong Man Keung put Fat Gor and Sing Sing in PROJECT GUTENBERG and created a currency counterfeit crime story with a rare villain duo battling brains and brawn. Speaking of the reason of joining this film, Sing Sing stated, "There are too many places to spend money, I want to try any chance to make money. However mainly Fat Gor sweet talked me into the performance." Fat Gor said, "He recently had a child, parenthood is very expensive, not to mention he has a daughter! Since we are good friends, he is in a bind, I help him out so he can live a little better. In addition I am familiar with this matter." Sing Sing said, "You see! This is how he sweet talked me into the performance!" Fat Soh made a surprise appearance next to Fat Gor on the stage. Bona film chief Yu Dong boldly proclaimed, "I hope this film's box office will be able to break 3 billion and surpass HELLO MR. BILLIONAIRE."